This tree has been sitting on my benches for about three years. It has some interesting twists, and some very challenging angles in old wood that made it a compromising puzzle to find the best front and inclination. 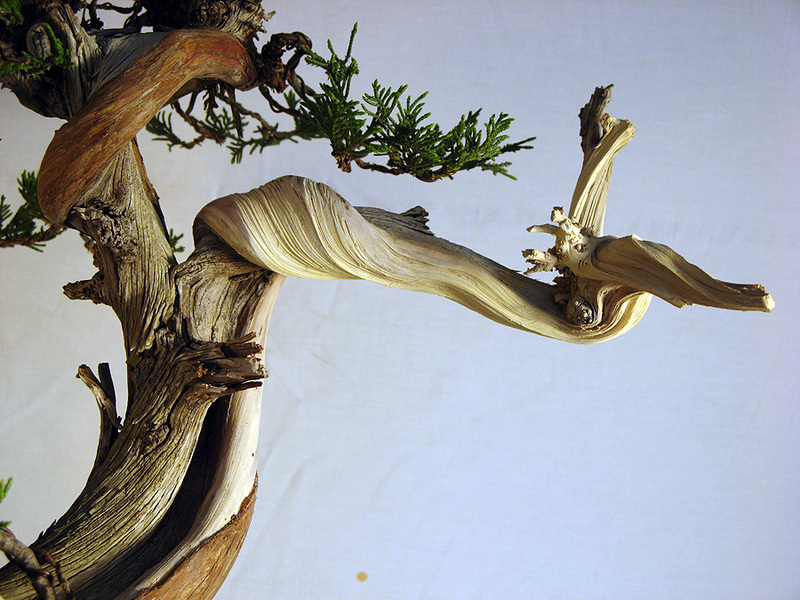 The Rocky Mountain juniper before styling. One of the best features of the tree, a very old cascading, twisting branch. The large right upper branch was stripped and carved. Final photo. Tree is 32″ from apex to bottom of the cascade. The lower branch in particular needs growth to fill out and balance the lower cascade. Also the training pot is too big to be a final pot. So there is still development to be done with this one, as ever. Whenever was a bonsai done in a day? I enjoyed working on this tree. The rigidity of the basic structure—the old branches—did not allow the usual harmonies to be imposed on them. And so I left the tree pretty much as it was. I think in the future a very interesting tumbling pattern of foliage pads could develop, almost like water coming down a waterfall over an erratic pattern of rocks. You’ll have to teach me how to carve like that! Great work yet again. I cant wait to see it in person. Very interesting Juniper, and work also. Will you need to do foliar feeding to catch up the sparse foliage on the lowest branch? Are scopulorums apically dominant? What beautiful branches! A lovely tree. Although it is controversial, I do foliar feed. Also I just spray the weak branches with water whenever I have a hose or can in my hand. The thing I worry about is the fungus phomopsis, which can take out branches here and there very quickly. And this tree has had some of that. So I try to stay on top of a fungicide schedule with junipers. Rocky Mtn. juniper like any juniper is moderately apically dominant, but it’s not hard to control, as black pine is. Wow! Very unique I absolutely love this tree and what u have done with it so far! It’s beautiful! This has great appeal ! I love it. Your respect for the tree comes through in this styling! Do you plan more carving in the future, like perhaps separating the thick front vein in two? Do you think the tree will do that on his own with the pruning of the top right branch? Yes, my plan was to separate the large vein in front, but I wish to wait to do that as the tree underwent stress in the styling to begin with. Probably next summer. I think the tree will likely retain all the living tissue of the vein. There is another front, and in some ways I prefer it. It is on the left side, and is less dramatic, so it photographs less well, and yet there is much more harmony there and it’s very quiet and calming. And there is more of that ‘untouched’ feeling over there, less visible carving, etc. The deadwood is old and has better movement with the live veins. I have to pot up the tree in the spring, and I am still considering which way I will go with it, with the front I’ve posted or this other one. I will post this other front sometime. I like the juniper very much and … I am about to criticize it. I am not sure whether you like it or not then I send this email to you. Please reply if you do not mind. 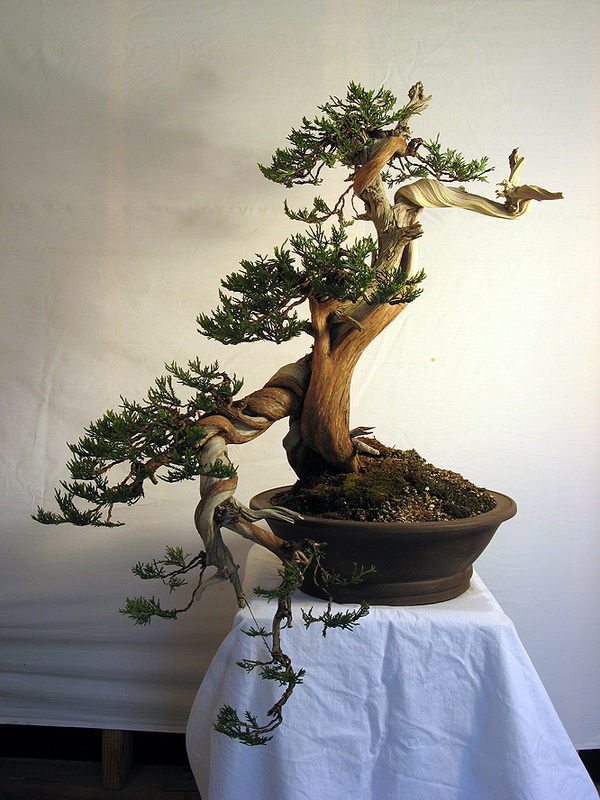 I am a big fan of California Juniper and I have collect some of them. I can send you the pictures too so you can give me your point of view. The multiple twists are amazing, especially in the lower part. Have you ever tried to mimic that kind of twisting on a home grown tree? Yes, you can mimic this although it takes time. If you have a young tree, like a whip, you can twist the trunk as you wire it, and later create shari lines that mirror that. 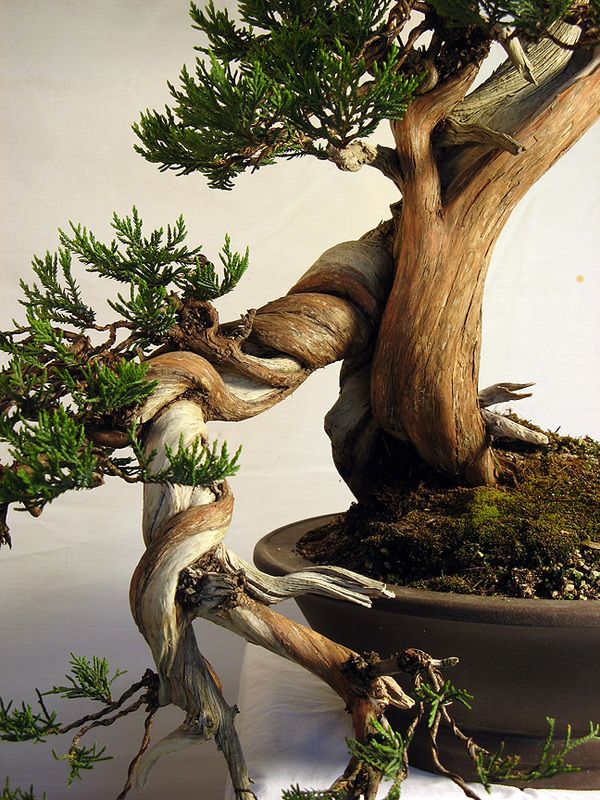 Also, it is quite possible with juniper to create a twisting shari line on a bean pole trunk. Just go real slow with the progression of the shari. The fluid movement will align to your new path. The problem tends to be you will have a twisting live vein that is putting down twisting wood, on a straight grained under-trunk. That can look odd. It is impossible to carve that and make it look convincing as you’d be going counter-grain. 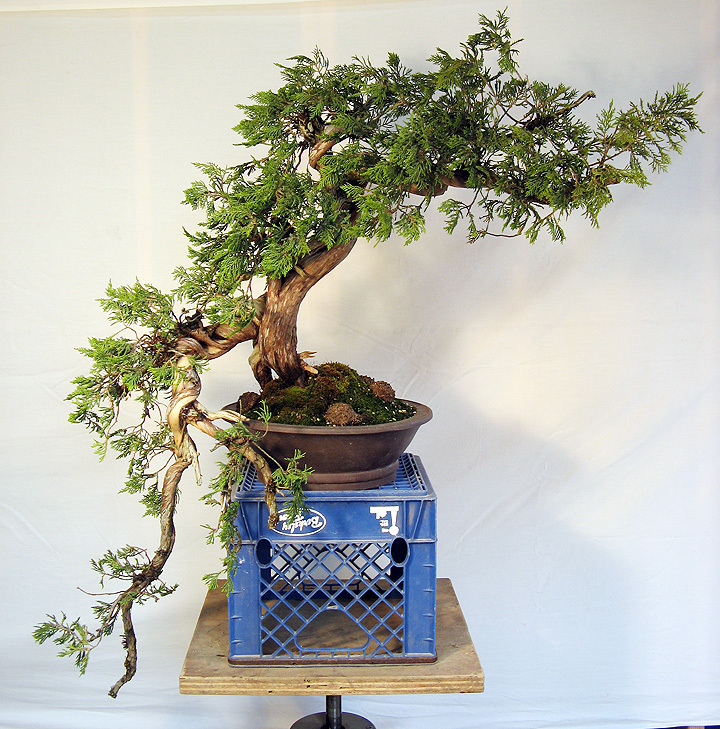 Great blog and some great work on this juniper. You’re mentioning Phomopsis – which is also a huge problem here in Denmark – which fungicides do you use to stay on top of this disease? Ah, Denmark too? Phomopsis is not an easy thing to kill. Prevention is difficult if it is around. But you can control it using Protect or Domain or Subdue. Many of the listed fungicides here can only be bought from a nursery supply center, not local nurseries. So they are expensive and hard to find. ZeroTol is a quick remedy, but would need frequent application. That is an oxygenator, essentially a very strong form of hydrogen peroxide, and it will kill most things—bacteria, fungus, algae. The fungicides tend to have more residual effects, though, meaning the protection would last longer. I know this is an old post, but do you have one to sell?